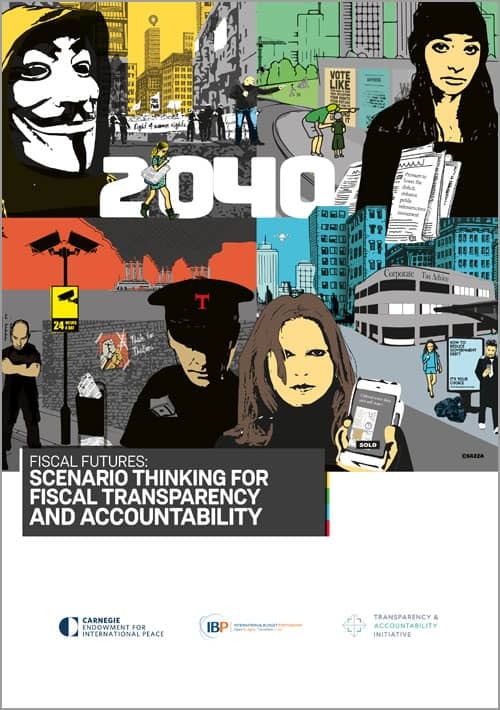 In early 2018, the International Budget Partnership, the Transparency and Accountability Initiative, and the Carnegie Endowment for International Peace initiated the Fiscal Futures Project, inviting fiscal transparency and accountability advocates, practitioners, scholars, and funders to collectively imagine what fiscal transparency and accountability may look like two decades from now. Together, we generated four plausible scenarios intended to tickle the imagination, inspire ideas, and spark conversations – especially among advocates and practitioners who struggle with fiscal issues in their daily work. Scenarios are stories that allow us to explore how we can shape the future based on the interplay of various driving forces. By placing fiscal transparency and accountability issues in fictional but feasible futuristic settings, we can examine today’s strategies from the vantage point of future outcomes. Experts in the field of fiscal transparency and accountability share their thoughts on the Open Budgets Blog. Our scenario stories take place in four different fictional countries named Thule — a metaphorical place located beyond the borders of the known world. 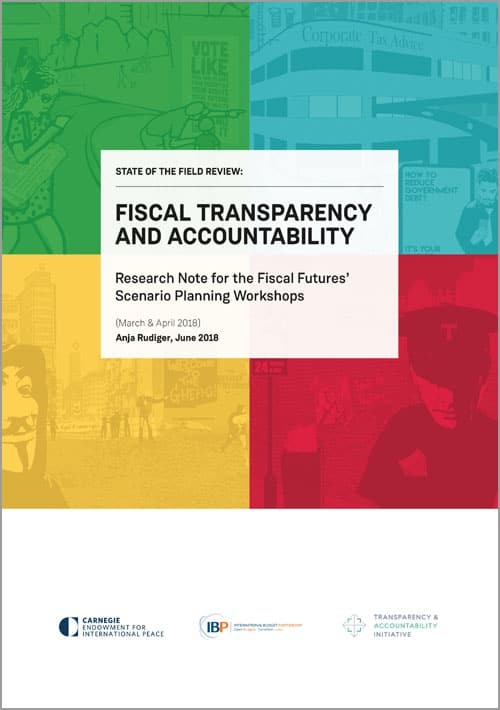 The state of fiscal transparency and government accountability in each Thule is centered on the interplay of two main variables: democratic governance and civic engagement. Other driving forces include: technology, data, and automation; corporate power; and environmental challenges, including climate change. Each scenario illustrates the crucial role of public finance systems and policies in advancing — or undermining — economic equality, social justice, sustainable development, and human rights. We hope that the four stories presented encourage you to explore your own ideas for transforming public finance around the world. People vs. Profits: Rights, public goods, and empowerment against corporate power. Get Real or Get Robots: Centralized, digitized, and distracted government and citizens risk disengagement. Repression Grows Resistance: Corruption and inequality breeds resistance and solidarity. Prestige Is Power: Authoritarian politics of extraction and populist diversion. Green Thule is a small, upper-middle-income country with a strong democracy and a high level of civic engagement. 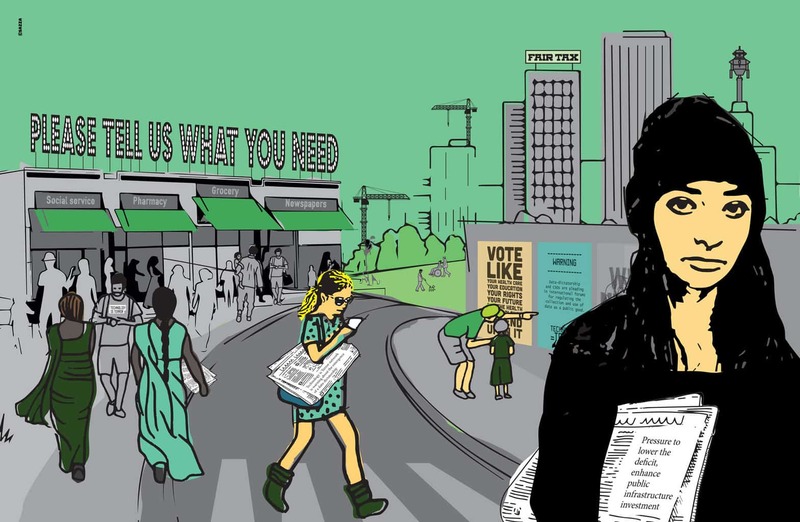 Originally a representative democracy with open and democratically responsive governance institutions, Green Thule has gradually developed strong participatory processes to complement its representative mechanisms. The president of Green Thule, the first female head of state, leads a female-majority cabinet and has supported the adoption of gender quotas in all public institutions to advance gender equality more broadly. The judicial system effectively guarantees not only political and civil rights for all residents, but also economic and social rights. The economic sphere has seen an emergence of public benefit corporations and worker-owned cooperatives, but they are dwarfed by the presence of transnational corporations. The government uses an accountability system based on human rights principles that guide how public money is raised and spent. Budgets are developed — and funded — following participatory needs assessments, which prioritize urgent and deep needs. Rights-based indicators measure whether revenue and spending initiatives meet people’s needs, and whether they do so in an equitable manner. Those needs (food, health care, housing, education, social protection, and a healthy environment) are recognized as rights and largely financed publicly. At the level of basic provision, these goods and services are not sold as market commodities but are free for everyone, paid for through progressive taxes. Because of environmental considerations, water and energy are subsidized only for the low-income population; for the majority, utility fees increase with rates of consumption. Gender disaggregated data is used to assess the budget’s impact on women and men, and public financial management systems are required to maximize gender equality outcomes. Green Thule’s revenue measures are designed to fund a needs-based budget and to advance redistribution. Tax morale is high, and compliance costs are very low, as most people realize that taxes serve the public good. Thule has maximized its fiscal space by raising the ratio of tax revenue to gross domestic product (GDP) to 65%. The majority of tax revenue is derived from individual income taxes, starting at three times the poverty rate and rising to a marginal rate of 70% for high earners. This tax is supplemented by VAT on luxury goods and services. Carbon taxes seek to deter use of remaining fossil fuels. A wealth tax instituted in the 2020s has further increased the progressiveness of the tax system, and the government is considering allowing regions to impose taxes on speculation, both financial and real estate. Corporate taxation is subject to intensive lobbying by corporations and civil society organizations. Despite rising corporate profits, the government felt compelled to reduce corporate income taxes in the face of international tax competition. Corporate taxation now contributes only 15% of total revenue. Under pressure from civil society, the government is trying to think outside the box and has proposed a new tax on data flows, along with a tax on wage inequity. The latter would tax businesses according to a wage equity formula, whereby companies that have high wage differentials between top and bottom earners would pay more. This new type of tax is supposed to counter public criticism of the recent cut to corporate taxes. However, countries in the region are caught in a race to the bottom in their attempts to incentivize corporate investment. Upon announcement of these new tax proposals, a number of transnational corporations – among them “Tech’s Frightful Five”, the successors to Alphabet, Amazon, Apple, Facebook, and Microsoft – have threatened to move their headquarters elsewhere. Green Thule’s government is strongly committed to international institutions, such as the United Nations, and to fulfilling its obligations under international agreements. It has repeatedly used international forums to plead for stronger global financial regulations, arguing that most of the wealth created by large corporations eludes national taxation as corporate profits are siphoned to tax havens off-shore. Green Thule’s fiscal experts continue advocating for a global system to curb transnational illicit flows. Despite a recent online data dump that reveals large-scale corporate tax evasion, international financial institutions remain unresponsive. With a relatively high overall tax burden and high levels of spending on public goods and social protection, Green Thule’s government is struggling to maintain economic growth and limit the deficit. Fiscal pressure results mainly from the cost of pensions and health services for an aging population. While spending on key public services — the majority of Green Thule’s budget — is relatively secure, the country’s energy and transportation systems have suffered from under-funding for the past few years. This has sparked public debate about paying down the national debt versus embarking on important public infrastructure projects. The government recently decided that reducing the deficit would lead to lower interest rates and thus create a more favorable climate for infrastructure investments. Corporate lobbyists welcome this policy, arguing that it will further economic growth. However, the growing community of public benefit corporations and cooperatives provides an alternative voice for more direct public infrastructure investment. Green Thule’s residents are well-educated. People take classes in fiscal literacy and budget participation from an early age, and they exercise their right to information, which is legally guaranteed. Most have advanced knowledge of and access to data and digital systems, and are aware of the dark sides of technology. The majority of people are politically active, motivated by the rule of a human rights-based system of law and policy. Civil society organizations have blossomed and secured an important role in public debate and policy-making. They are currently advocating for long-term investments in public infrastructure and measures to address environmental degradation. Many groups also carry out intensive organizing to achieve high levels of civic engagement in the formal needs assessment process, and are now pushing to expand participation to all stages of the budget cycle, combined with greater limits on the power of representative institutions. Historically marginalized communities have largely achieved inclusion, driven by sustained social movements, which has led to a more cohesive society. However, more recently, Green Thule has seen some challenges to that cohesion in the form of rising tensions between modern secularists and more traditional religious communities around human rights issues. Some faith-based groups are uncomfortable with the strict separation of church and state and public spending on secular education, reproductive care, and gender-neutral public facilities. Their street protests have, on occasion, led to clashes with secularists. Mediascapes are diverse and independent of governmental control, although not always free from corporate influence. Investigative reporting (including on fiscal matters and cases of corruption in the country’s banking system) has a strong tradition. The majority of people are active on social media to various degrees, and political groups, community organizations, and movements network and mobilize via social media. The exponential growth of “convergence” technology (which combines computer and telecom technology with robotics, artificial intelligence, and biotechnology) is affecting all spheres of private and public life. Tax collection uses smart neural network technology, which has increased efficiency and reliability. Government spending accounts are increasingly managed by humanoid robots that are also capable of communicating with citizens in a knowledgeable, patient, and service-minded manner. However, the robots have altered the dynamics of participatory fiscal governance, and some CSOs have raised alarm about the integrity of rights-based decision-making. They fear that the use of artificial intelligence may be a slippery slope, and that future decisions about trade-offs on less prominent spending issues may be managed electronically through complex algorithms that would prioritize efficiency and cost-effectiveness instead of human rights and needs. Moreover, most of these advanced technological systems and their supporting services are owned and delivered by “Tech’s Frightful Five.” As traffic in fiscal data has become a profitable business, these companies are pushing for an expansion of electronic spending management that utilizes the next generation of predictive modeling. Yet mobilization against corporate control of technology and data is increasing. The new “Technology is Terror” network is warning about the emergence of a data-dictatorship and CSOs are pleading in international forums for regulating the collection and use of data as a public good. Green Thule faces challenges posed by rapid urbanization. Like many other countries, Green Thule is confronted with natural resource shortages.Water shortages are a pressing concern in big cities. Green Thule was hoping for international assistance, but a designated UN program failed to raise the $40 billion needed to improve water infrastructure in global cities. Community groups have begun to mobilize against public spending on UN missions, demanding that public funds are instead re-allocated to domestic infrastructure development. In the Green scenario, the goals of fiscal transparency, participation, and accountability are robustly promoted and protected. Yet there are several challenges that need collective attention to avoid the Green scenario backsliding to a more problematic situation. It is not too late for Green Thule to develop strategic plans for addressing growing fiscal pressures, transnational corporate power, natural resource shortages, and the “dark side” of high tech. What will it have to do to sustain its rights-based democratic institutions along with civic participation in fiscal processes and policy? Blue Thule is a medium-sized, middle-income country, highly centralized and efficiently automated. Its representative governance system has a tradition of national public deliberation and consultation, with the aim of maintaining a politically engaged population. For the past decade, Blue Thule has been governed under the aspirational motto “information and participation for all.” Throughout the 2020s, successive administrations took measures to increase transparency, publishing detailed budget data. Most importantly, Blue Thule put in place a state-of-the-art secure online citizen participation system, accessible via new biometric technology. This allows policymakers to regularly consult citizens on fiscal matters, although does not obligate them to abide by citizens’ input. While initially the biometric technology underlying the citizen participation system caused accusations of Big Brother-ism, concerns were quickly appeased when the new government elected in 2025 imposed data privacy regulations, along with accountability mechanisms to ensure these rules were implemented. Over the next few years, the private tech companies managing the system largely complied with privacy provisions and the issue of online participation gradually disappeared from the public news cycle. At the same time, fewer and fewer people availed themselves to this fiscal participation opportunity. Leapfrogging competitors through smart adoption of technology, Blue Thule has seen significant development gains over the past 20 years. However, despite stable economic growth of 3% per year, and a slightly above average tax to GDP ratio of 40%, the country’s prosperity has not been equitably distributed. Reliance on a flat rate regime of indirect taxes, especially on consumption, is high, including an 18% VAT rate. Property taxes on residents and businesses located in the country’s most desirable census districts were designed to increase the progressivity of the tax system; however, many have managed to evade tax payments. Income taxes contribute barely 15% of total revenues, and there are only two income tax brackets, with everyone earning above minimum wage taxed at the slightly higher rate. Although the government sought to stimulate a public debate about new approaches to capping income, potentially as part of a comprehensive tax overhaul to increase equity, responses to its proposals were muted. It also received little public input on whether to mainstream gender throughout its fiscal policies. While a good number of past spending programs targeted women and girls, as of yet these programs have not succeeded in reducing gender inequality. All in all, Blue Thule’s fiscal policies have not had a significant equalizing effect and point to the country’s ongoing struggle with economic and social inequalities. Blue Thule has made an efficient transition to a predominantly automated workforce, initially incentivized by tax breaks. Five years ago a global tax agreement among the G30 shifting to unitary taxation (taxes due per jurisdiction attributed through an agreed algorithmic calculation) has led the country to see a small decline in its share of transnational corporation taxes, while larger economies have benefited. Subsequently, the state imposed a temporary corporate tax increase on big manufacturers, which is set to sunset this year. The corporate sector is now pushing hard for reductions in its share of the tax burden and is gaining more influence as civic participation in decision-making declines. It has donated large amounts toward the management costs of the online participation system, and funded many candidates running in the upcoming elections. Though some media outlets have tried to rile up public outrage at corporate lobbying, there has been little popular response. Many people feel disconnected from manufacturing industries in which they no longer play any role except as consumers. Fiscal pressure results mainly from low labor market participation rates, especially from young people. There is growing competition over public resources between an older generation, which still wields some political influence, and the majority of young people, who are disengaged. Blue Thule used the temporary corporate tax rate hike to fund the establishment and first five years of a universal basic income program, partly in response to increasing automation. This significantly reduced spending on social protection programs, yet increased fixed budget obligations. Providing a modest basic income may not be a sustainable solution for Blue Thule, and the regressive effect of consumption taxes neutralizes its benefit for lower income people. Blue Thule has a high level of national debt. While the public is largely disinterested, corporations are keen for the government to pursue debt reduction policies in order to reduce their own financing costs. The government decides to use the online participation system to consult the public about its views on national debt reduction: Choice A is through progressive individual and corporate income tax increases; Choice B is through public spending cuts and the sale of public assets; and Choice C is through a combination of both A and B. Information about each option is publicized through a range of corporate media outlets, as well as advertisements financed by corporations. Given growing participation apathy in the general population, online voting is low. Fearing another fight with corporations, the government is relieved that the popular preference seems to be for Choice B, enabled by the highly orchestrated corporate information campaign. As fiscal pressures are mounting, the increasingly technocratic elite in is more and more inclined to cater to the corporate agenda and accept the role of citizens as consumers. The government implements cuts to the basic income program and public services, and reduces corporate taxes. The 2030 government invested in initiatives seeking to stimulate the growth of a competitive media landscape, yet most e-news sites are owned by subsidiaries of Blue Thule’s manufacturing companies. At the same time, the government prohibited the dissemination of political content on social media sites, because through the late 2020s, social media platforms had been seen to influence the online budget participation system. By the mid 2030s, statistics on online fiscal participation revealed steadily declining levels of citizen engagement, despite significant improvements to the consultation system, which had become increasingly easy-to-use and secure. Only Blue Thule’s high- and upper-middle-income population, well-educated and fiscally literate, appears to be participating in the fiscal consultations. Although budget participation and the right to information are regularly discussed in priority-access e-newspapers and studied in university courses, a growing number of Blue Thuleans have taken to ridiculing the country’s information and participation motto on popular e-comedy sites. There are no local budget processes that could make fiscal policy issues relevant and interesting to citizens. With the decline of civic engagement, Blue Thule’s model of a deliberative democracy has shifted back toward a more traditional representative democracy. Blue Thule is home to two fast-growing megacities. Seventy percent of the population lives in these cities and the urban sprawl surrounding them. These urban areas employ technology to develop Smart City innovations, with automatic systems to detect areas liable to crime or in need of maintenance, and high uptake of self-driving cars. Soaring levels of consumerism generate large quantities of waste. Transnational corporations continue polluting the natural environment to meet popular demand for consumer goods. Rather than curtailing cheap mass production, the state requires corporations to invest in disaster-response technology. Data privacy regulations have allowed people to share their data with private companies in exchange for a fee, which is taxed and reinvested in disaster-response technology. It is so easy to gain this extra income that many people now devote more and more time to online content and entertainment. This is particularly the case among the increasingly large youth population, who has reacted to the lack of good jobs by selling their personal data, thus supplementing their basic income. While educational opportunities are provided for all, the rate of those pursuing higher education has steadily declined. The job shortage has reduced the incentives for pursuing education. Society as a whole has adopted the mentality that ‘you only have yourself to blame’ if you are unhappy. Over the past few years, sales of anti-depressants have soared. A neighboring country, without the foresight nor the resources to anticipate disasters, suffered from several shattering earthquakes in the 2030s. Blue Thule responded with a refugee resettlement program, vetted through an online consultation in which only a small proportion of the population participated. Many Blue Thulean citizens have taken an “it’s ok as long as it’s not in my own backyard” approach to the issue; moreover, distracted by consumption and entertainment, the needs of these newcomers are hidden from their view. Refugees live in separate settlements and rarely interact with local citizens. They are not eligible for the basic income program or public services, and many are working in waste processing to make ends meet. Refugees are not authorized to take part in the online participation system; instead, they vote to elect their own community leaders. Protests against refugees have been far and few between, but are growing. The Blue scenario demands political action to address the weakening of democratic processes and institutions and the increasing risk of state capture. If disengagement, inequality, unemployment, and corporate power increase, Blue Thule could shift toward a more dystopian scenario. On the other hand, if the Blue scenario were able to reinvigorate its tradition of civic deliberation and engagement, curtail corporate influence, and make fiscal decisions that strengthen the social contract, it could move toward a more desirable future. Yellow Thule is a large, lower-middle-income country. In the mid 2030s, Yellow Thule’s liberal government was engulfed in a huge corruption scandal. Combined with rising unemployment, overcrowded cities, and climate change-driven mass migration, this crisis enabled a ‘revolutionary’ independent candidate (secretly funded by a major corporation) to be elected by a large margin. The candidate promised to end corruption, stop migration, and restart the economy. Instead, he curtails parliamentary powers and appoints a cabinet made up of former corporate executives, all of whom are men. The new administration embarked on neoliberal economic policies aimed at corporate deregulation and tax incentives. In the first two years, economic growth increased (rising from 2% to 4% ), share prices rose significantly, and corporations moved more functions into the country. Three years later, there have been several structural changes to the economy. The lack of competition laws has enabled a raft of mergers and acquisitions across a multitude of sectors, including banking, technology, media, transport, resource extraction, and manufacturing. Data privacy laws regulating the commercial use of personal data have been eliminated. Corporations have replaced large parts of the workforce with intelligent machines. High unemployment levels have resulted in a two-tier society that juxtaposes a managerial employed class with a sizable unemployed and underemployed class. Like several other countries, the new government has withdrawn from all international environmental and migration agreements. Corporations have restarted the extraction of the limited fossil fuel resources remaining in the country and the surrounding seas. Decisions in land rights disputes consistently favor corporations, and marginalized rural communities face increased threats to their ways of life. Moreover, the country’s economy has been seriously disrupted by rising sea levels, which are beginning to submerge key coastal ports and trade centers. As economic growth stalls and begins to reverse, the country faces a broken fiscal system. Domestic revenue mobilization is limited, with the tax to GDP ratio dipping to 15%. Fiscal space for combating growing levels of poverty, improving public services and fixing critical infrastructure has diminished. A strong push toward increased reliance on domestic revenue, encouraged by international financial institutions, has largely failed, hampered not only by poor economic performance by also by corporate lobbying as well as growing social unrest. Disengagement by the international aid community in previous decades has taken its toll. Unchecked corporate power has seen a proliferation of corporate tax breaks and incentives, and corporate taxes have repeatedly been cut. All income, wealth and inheritance taxes have been scrapped. Instead, the country relies on a plethora of indirect taxes and fees, which has further untethered public expectations of the state’s obligations to provide public goods. Income from VAT, levied on all goods and services, including basic needs, now comprises 60% of total revenue, yet receipts are shrinking. The international community is beginning to rethink its position as it sees the risks of spillover effects. The budget exercise has become increasingly superficial. Budgeting is dominated by the executive, with automatic approval by the legislature and no role for public participation. There are grand pronouncements on spending, yet little money reaches the people. The government makes a show of algorithmic-based allocations to match needs, but there is no transparency around the actual decision-making. In practice, many social sector programs are routinely underspent by 35-40%, and it is estimated that more than 25% of the budget is spent illegally each year. It is becoming increasingly clear that Yellow Thule suffers from high levels of corruption in the public sector. There is no independent auditor; the government uses an international private accounting firm to hide improprieties in its annual public accounts. Corporate-friendly legal and financial provisions facilitate large scale tax avoidance by corporations. Yellow Thule’s access to fiscal information law, dating back to the early 2020s, has lost credibility due to the subordination of regulators to the political authorities. Most government spending supports national defense and the police, while health care and education, both of which had been the strongest pillars of society, have been privatized. Corporate lobbying, using promises of significant efficiency gains and cost savings, has led to the outsourcing of many security functions, which has fueled a growth in the number and influence of private security companies. The privatization of education has seen critical subjects, including all governance-related topics, scrapped in favor of technical education. Previous efforts to invest in women and girls have been abandoned. Public health has begun to deteriorate—the densely populated cities are a Petri-dish for drug-resistant diseases. A new superbug has spread among poorer populations, and deaths by infectious diseases are on the rise. With a privatized health care system, many cannot afford treatment. Civil unrest is bubbling under the surface as the economy dips into recession, unemployment becomes structural — disproportionately impacting women — and poverty rises. Many civil society organizations actively scrutinize and challenge the government, communities are becoming organized, and new social movements are forming. When a group of hackers access and distribute information revealing how budgeting algorithms have helped direct spending away from public services and toward elite interests, waves of protests pour into the streets, day after day, spurred on by organized grassroots groups in many local communities. Concerned by these ongoing protests, the government seizes on accusations of rioting and damage to private property (possibly caused by government provocateurs) to declare a state of emergency. It labels protesters as domestic terrorists and enacts a raft of new security measures. Civil society organizations are criminalized, protesters are arrested, elections postponed until further notice, independent media outlets banned, private security forces deployed to the streets, and enhanced surveillance measures implemented. Corruption and failed economic policies have drive Yellow Thule into a fiscal and political crisis. Debt has spiraled, creating incentives to borrow internationally. This opens up the possibility of external pressure on the Yellow Thule government from international financial institutions and other donors. The latter are considering re-engaging with budget support in exchange for a human rights review and fiscal commitments, including allowing donor tracking of funds with the tools of artificial intelligence. Although the administration sees no other revenue options for restoring its economy and social cohesion, it is wary of exposing itself to international lender controls. In the meantime, the interior ministry speeds up the implementation of a new national identification system. A micro-chip implanted on people’s wrists offers priority access to public services, transport, and the purchase of many goods, most of which are controlled by a handful of corporations working closely with the government. The data available through this chip allows the government to identify any individual who may present a future challenge to the state. Distrust of the government leads to low implantation levels. In response, the government makes the chip a legal requirement and security forces are tasked with finding those who are not registered. Some people retreat into the largely abandoned rural areas; others remain undocumented in the cities. Discontent in the cities is high, but in the vast rural areas alternative, underground communities are starting to develop. Through projects of survival, including community farming, 3-D printing co-ops, skill-sharing networks, and time-banking, these communities are establishing modest yet functioning and environmentally sustainable economies and are able to provide basic education and health care services. Many communities develop their own participatory local governance systems, where decisions about community taxes and spending are made through a system of local people’s councils. 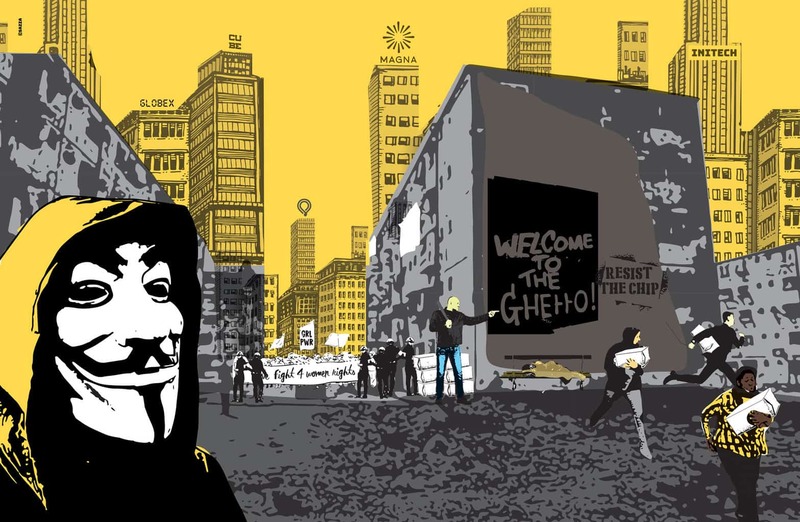 A group of hackers sets up an alternative media network, which connects several resisting communities. Some communities are also linked into a global Network for People Empowerment, which is using social media to raise awareness of the growing resistance in Yellow Thule. International solidarity for Thule’s alternative communities is rising, and support groups are forming in neighboring countries. Nevertheless, limited resources, geographic dispersion, and the threat of discovery are major challenges to the survival and sustainability of these alternative communities. Yellow Thule’s economic and political institutions serve predominantly corporate and elite interests. While formal civic space has been eliminated, hope rests on alternative communities that have developed their own micro-societies. As popular resistance grows and becomes better organized, Yellow Thule may be approaching civil war. The yellow flag is raised to indicate an elevated state of risk of sliding toward the worst-case scenario. However, radical reforms may be possible if community-based resistance could draw support from international coalitions of governmental and non-governmental forces. 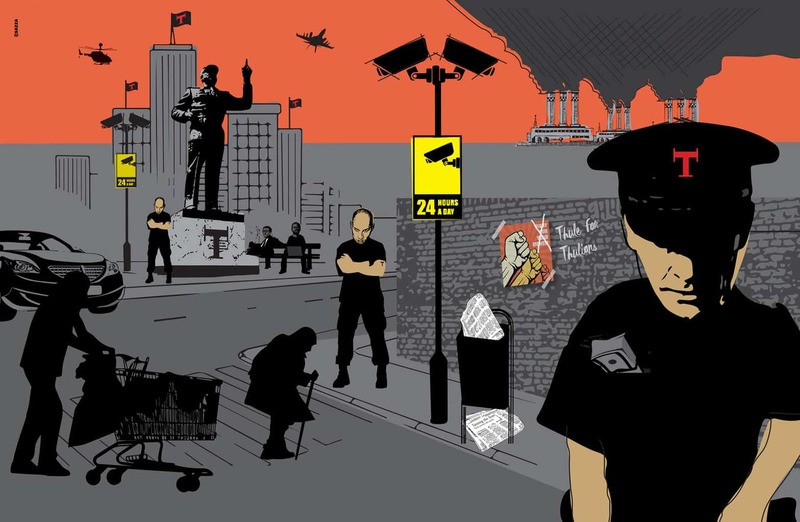 Massive electoral fraud in 2024 triggered large-scale protests, which led to mass detentions. Government-owned media branded protesters as enemies of the people intent to undermine Red Thule’s progress toward ever-increasing prosperity. Since then, civic engagement has plummeted, civil society organizations have ceased operations, and critical journalists have ‘disappeared’. International transparency groups, donors, and the UN Human Rights Commission initially submitted messages of protest and demanded international sanctions, but just a year later, the country’s international standing was back to normal and Red Thule resumed its supply of raw materials to the rest of the world. Between 2025 and 2030, Red Thule benefited from foreign capital flows and extractives investment and achieved economic growth rates of up to 5% per year. However, Red Thule’s strong position as the key provider for battery components is being challenged by other emerging forms of energy, and its GDP has nosedived as resource rents dramatically declined. Although extractives revenue, in the form of customs duties and extractives fees, continues to be the country’s main source of income, the government recently began imposing indirect taxes, specifically VAT on basic consumer goods, with strong penalties for any perceived subversive tax evasion (to cut off an emerging underground economy). Public spending is centered on industry infrastructure, national prestige projects such as sports stadiums, skyscrapers, spaceships, and resource exploration missions to Mars — all of which fuel public pride — along with security and surveillance. Basic services are provided at low cost by subsidiaries of the two main extractives companies, who in turn receive most of the consumption tax revenue collected by the government. The regime publishes a summary of the public budget every four years, although the imposition of VAT prompted the country’s elite to request greater transparency. However, the administration pointed out that most regular expenditures are covered by its contractual agreement with the two main extractive corporations, which is of a proprietary nature. Since none of the seabed mining locations can be claimed by local communities, profits (and costs) do not have to be disclosed. In fact, most people are impressed by the leaders’ largesse, which pays for all prestige projects. The idea that national spending and revenue should be public information has eroded completely and only a handful of journalists, based abroad, dare to publish articles about public finances. Within Red Thule, information about government finances has been replaced with statistics and stories of energy revenue sabotage by Red Thule residents. Coastal residents in particular have become subject to personal data mining and online smear profiles disseminated by government-funded PR agencies. As the Red Thulean population appears largely passive, the lack of fiscal transparency and accountability is not questioned. Instead, corruption and crime have taken hold in large segments of the population, thus legitimizing the government’s politics of fear. Fear mongering and scapegoating is particularly directed at the growing number of marginalized and impoverished people, as well as labor migrants working in the extractives sector. New technologies are exclusively used for purposes of social control. The country’s political leaders are divided over whether to continue pursuing a more populist approach, or whether the time has come for more heavy-handed military control. As economic disparities grow, divisions between population groups become visible geographically: urban slums proliferate, juxtaposed with high-security gated enclaves that overlook Red Thule’s cities and coastlines. Because the media landscape is monopolized by the government and its corporate partners, and social media is saturated with jingoistic messaging, Red Thule’s disparate communities have little to no knowledge of people outside their own circles. However, this increasing polarization of the population, combined with high levels of mistrust, fear, and growing religious sectarianism, is threatening to backfire. Some are beginning to turn their resentment against political leaders. Although Red Thule’s legal system is very effective in handling the interests of international corporations and foreign investors, the threat of instability causes some foreign capital to leave the country. In conjunction with dwindling ore resources for key global energy supply chains, fiscal pressures on Red Thule are increasing. A crisis point is reached after the enormous sea level rise in 2038 destroys key mining equipment and causes massive migration to already overpopulated cities. Urban environmental pollution rises to historic levels and endangers food and water supplies. The corporations contracted for protecting and providing basic public goods threaten to leave the country. A reaction from the international financial institutions is imminent, but as of yet it is unclear what it will look like. Exiled journalists comment that the international community has not played a helpful role in Red Thule’s recent past. They place their bets on growing popular discontent against the regime. Some isolated rights-based organizing is happening under the radar by people who cannot understand how their country ended up in such a tragic state. In the Red scenario the populist authoritarian government has disempowered its population and aligned itself with extractive industry interests. However, the country’s economic model is starting to collapse, its political leadership shows signs of fracturing, and popular discontent is brewing. This could turn the country into a potential powder keg. It could also inspire a peaceful revolution from below, especially with some strategic international support. Could there be a role for the international community, or can resistance and change come from below, or even from within government?